Today's snack bento was my first Christmas theme bento. I made 2 boys wearing the Christmas hat. The boys were made from rice balls, crab sticks and nori. It's easy to make for busy Monday morning. Inside the snack bento box : some chicken fillets cooked with teriyaki sauce, steamed baby corns, star shapes carrots & takuwan (pickled radish), and strawberries. I never mentioned takuwan for pickled radish before, until I read Debra's blog, Sheri's blog, Megan's blog, Susan's blog for quite sometimes now. I bought my takuwan from the Korean Supermarket near my house and always have them stocked in my fridge. 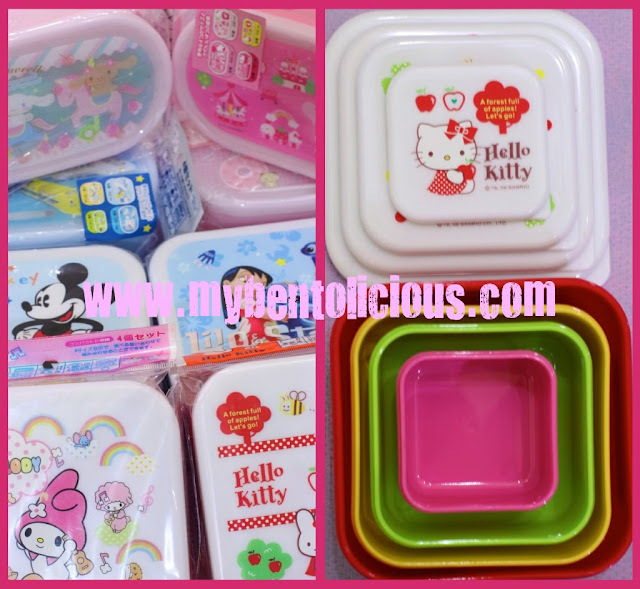 The above bento boxes are from my collection. The square one comes with 4 different sizes, 4 different colors and 4 different lids in every pack, while the oval one comes with 3 different sizes, 3 different colors and 3 different lids in every pack. The boxes are very convenient to store. I bought the oval one when we had a family trip to Taiwan last September. In Taiwan, bento is known as bian dang 便当. Bento accessories can be found at Daiso, Komonoya, Tokyu Hands around Taipei and other major cities. For the square one, I bought them in Jakarta. Thinking how lucky your kids are, to have a mommy who is really creative with the menu. This is so cute with smiling face wearing Christmas hat. Really brighten the the day :) Can I copy this and make one for our kids? cute elves. i prefer this yellow pickle to the red one. @Anncoo : Of course you can dear ... I also search here and there to get some ideas for my bento. Thanks a lot Anncoo! 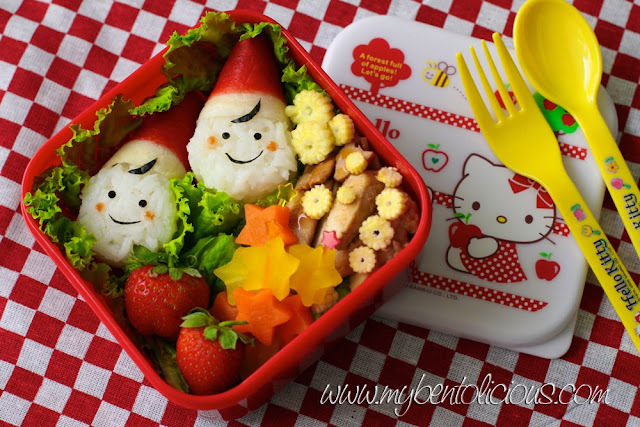 This bento looks delicious ^-^ Love those little guys. @Rara Pramasasya : Thanks a lot for your kind words Rara! What is your new blog address? Awww, I love the elves, they are so cute! Beautiful Christmas bento! @sherimiya : Hahahaha ... yup Sheri, the cute stuffs seem are haunting us :p Thanks a lot Sheri! Love the hk lunch box and the santa boy is totally adorable! @Kids Dream Work : Thanks a lot! Of course you can ... I also learn from others bento too, happy to share it!